MANILA, Philippines - President Benigno Aquino III delivered his sixth and final State of the Nation Address (SONA) on Monday, July 27, 2015 at Batasan Pambansa Complex in Quezon City. 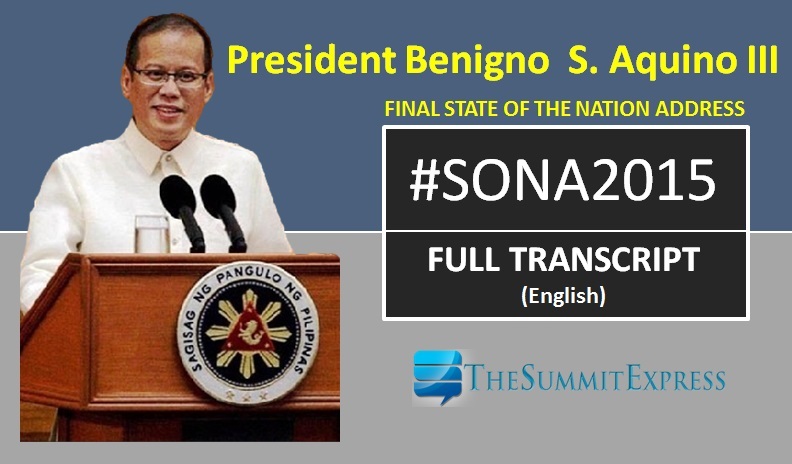 SONA 2015 full transcript of speech is now available online as shared by the Official Gazette in English language. On his SONA which drew 146 rounds of applause, Aquino recalled the issues of past administrations before his term, praised government officials who served as inspiration to the nation and boasts the accomplishments of the administration in the past 5 years. To Secretaries Edwin Lacierda and Sonny Coloma, former Secretary Ricky Carandang, together with Usec. Abi Valte and Manolo Quezon, [applause] who were the voices and online presence of the Straight Path: Truly, I felt the burden that you carried in answering questions, whether they made sense or not, to make sure that our countrymen received all the right information. To those like Joe America, a blogger who, despite never having met me, wrote: “If the President were in my foxhole, I’d watch his back. That’s because I trust that he is watching mine.” [Applause] I thank you and all our other friends from other shores who have express their unity with our transformation agenda. If I may make a special mention: to General Chito Dizon, former head of the PSG, and to its current head, Raul Ubando, whose first two weeks in charge were a true baptism of fire due to the Zamboanga crisis [applause]; To Lt. Col. Francis Coronel, head of my close-in security, as well as to SPO4 Lito Africano and PO3 Bong Fuyonan, who have been with me for such a long time [applause]; and to the entire Presidential Security Group, which has displayed utmost professionalism in protecting not just me, but President Obama and Pope Francis as well. Don’t worry. There are 21 more world leaders arriving for APEC. You have stood by me in times of trial and in times of relief. Perhaps later, before you sleep, you will ask yourselves why there seems to be so many trials, and so little relief. We are getting there. To Paul Cabral who makes sure that I always wear proper clothing [applause]; and to Cherry Reyes, who is both my hairstylist [laughter] and an economics practitioner, when it comes to the way she fulfills unlimited wants with very limited resources. To those working in my Private Office in Malacañang, especially to Usec. Rochelle Ahorro and Asec. Jun Delantar [applause], who have, in many occasions, shared in my stress. To those who never thought twice about helping repack relief goods in the aftermaths of disasters; to every Filipino who gave what they could and passed around coin banks to help bring about transformation; to those who made their support felt, whether through a text message, a letter, or by expressing it personally; to every child who embraced my leg, looked up, and smiled, every student who has asked to have a selfie with me; and to each person who waded through crowds just to shake my hand. In the area of disaster management: Because of concern for one another, and because of the active cooperation of the LGUs, we were able to ensure that Bohol and Cebu regained their footing after the earthquake. In Zamboanga and Tacloban, we focused straightaway on immediate needs. From delivering food, to making certain that there were no outbreaks of disease; from ensuring that electricity returned quickly, to opening roads; and even to housing and livelihood programs–our government poured and continues to pour all it can to help affected areas. [Applause] Yet there are also things left to be done: There are still communities living in danger zones that must be relocated away from threats to their safety. As regards rebuilding, there is a need to strengthen coordination between the local and national levels, in order to ensure that we finish projects at the soonest possible time. I already mentioned a while ago the SWS survey that was not widely covered in the news: that 8 out of 10 Filipinos believed that the Philippines will become–if not already is–a developed country in the foreseeable future. This is the opinion of our countrymen. But our economists in NEDA themselves are studying this in a scientific manner, and they have reached the same conclusion. It is clear: If we are not derailed—if we continue along the Straight Path—then we will reach first world status within one generation. If the reforms that have led to our dynamic economic growth continue, then it won’t be long before we can stand on equal footing with, if not surpass, the very countries we admire. [Applause] Did we even think this was possible back in the beginning?